NOCS President Mark Dowhaniuk shows how its done on Big Ed. This spring the Academy took to the road and dropped in on Cumberland & Vernon. Lots of great things happening in both places including a strong, mobilized community and great leadership. We are becoming more engaged as advocates throughout this province, working with the respective Land Managers to improve opportunities to grow the sport. As the rising tide continues to gain momentum, part of the essential recipe to build capacity is to empower our community through knowledge sharing. The Academy has become a tool for trail associations to teach modern techniques to build and maintain trails that are not only fun to ride but will stand the test of time. The Cumberland Crew got er dun! The United Riders of Cumberland works in tandem with the Village of Cumberland to grow the sport and improve the trails. Led by President Mike Manara, UROC is a well oiled machine backed by a solid team of builders working together to develop the network. With support from Kevin McPhedran and the Village of Cumberland, they have forged a partnership working towards improving both economic and recreational opportunities that serve the community. Working collaboratively, UROC and the Village are on the cusp of great things, if not already there. For anyone who has visited Cumberland you know there is some kind of magic in the charming town and of course, some great riding. The Academy practical session created a sustainable re-route on Mama Bear to tackle a long standing issue on the trail. The only question now…will the Riding Fool himself, Jeremy Grasby approve? 🙂 The NSMBA would like to thank all those in Cumberland for the invitation to visit and the hospitality while in town. The future here looks good. The North Okanagan Cycle Society is led by five year President Mark Dowhaniuk. 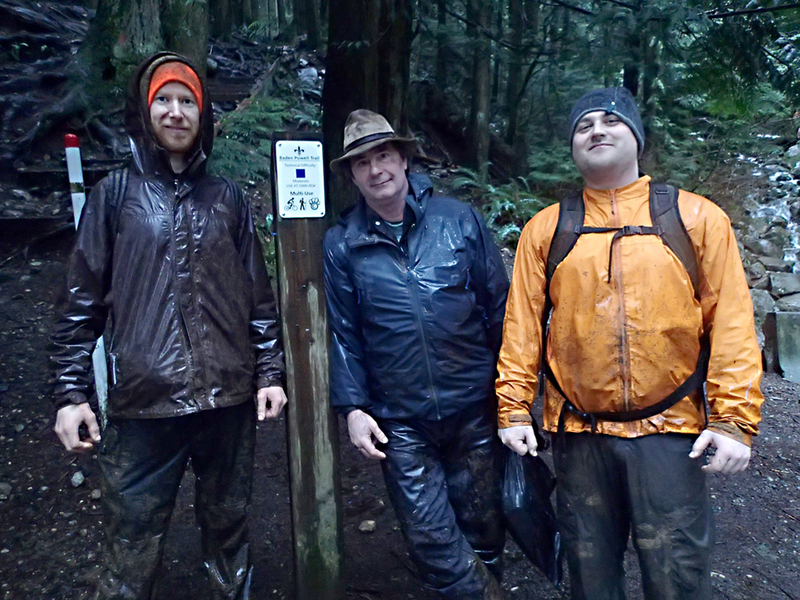 Forging a strong relationship with BC Parks, NOCS is developing trails at a rapid pace. New climbing trails are providing improved access. The sport is exploding in Vernon with weekly NOCS rides filling the rafters. The Trail Ninja program is creating a healthy youth culture and the symbiosis between the local building crews and the Silver Star empire of dirt is proving to be a delicious recipe for new trails and creative opportunities. For instance, Silver Star has been developing the All Mountain network at the resort for those wanting to get a pedal-on off-piste, and this is where the Academy tackled over 300m+ of rock slab trail in just two days. Under the leadership of Marky D, "Rock is the new Berm" took shape to be an inquisitive exploration in black tech art…that's the only way to describe it! Lots of great things happening in Vernon so drop in for a visit and savour the local flavour like Big Ed to Twisted Sista, a crowd pleaser indeed. A big thanks to NOCS and all in Vernon for the hospitality and hard work! Burnin' in Vernon…cutting trail in bug infested clear cut ain't no thang for the rock berm crew. Rock net was deployed, berms built and slabs hatched for your riding pleasure. "Rock is the new Berm"
The Academy continues to travel throughout the province, upholding the NSMBA Mission "Trails for All". It's becoming evident our sport is growing at a rapid pace and Knowledge is Power. No longer a fringe sport, mountain biking is not only growing, it is growing up. As stewards of the trails, our responsible approach is our best way forward to ensure we can positively affect the outcome of our trail networks. You can find more on the Academy HERE. Every good build has a happy ending.